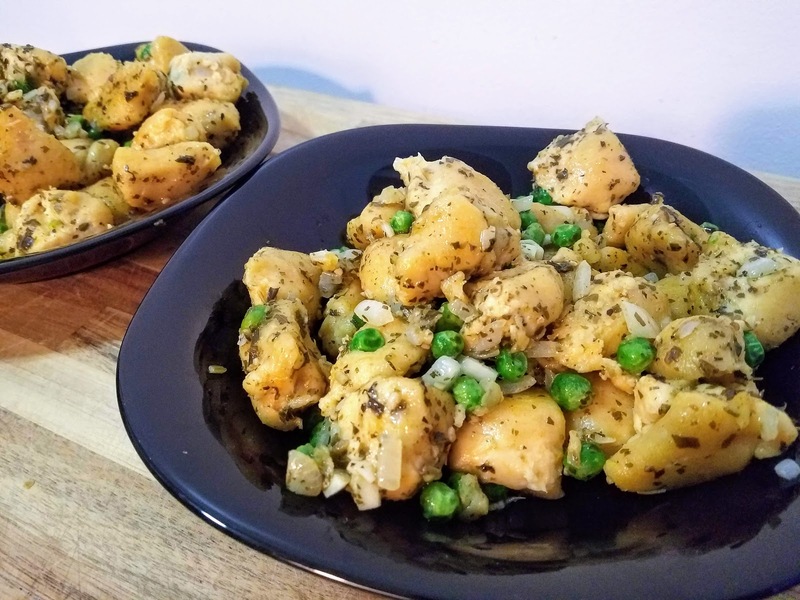 The recipe is made with sweet potatoes along with white potatoes, giving it a slightly orange color and a hint of sweetness. 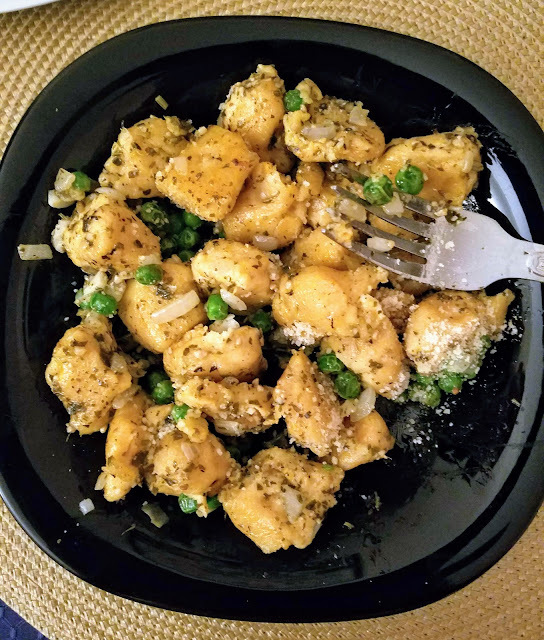 Hubby pointed out to me that with the rustic shapes and hint of pink-ish tinge, the gnocchi looked like chicken pieces in the skillet. That disturbed me more than anything, but he assured me that it was a good selling point? I assure you it did not, however, taste like chicken. It tasted like a delicious homemade sweet potato gnocchi! You could serve this with a marinara sauce, vodka sauce, or just drizzled with olive oil and freshly chopped herbs. 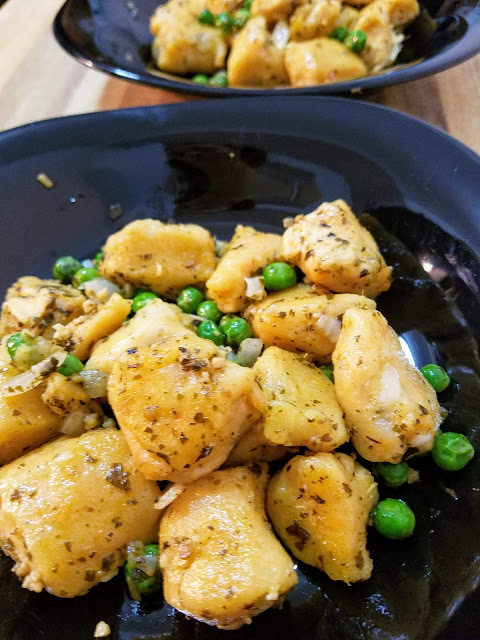 We had ours sauteed with garlic, onion, and peas, and topped it with a dollop of vegan pesto and some vegan parmesan cheese. Feel free to adapt to your tastes! Place chopped potatoes in a large pot and cover with water. Cover and place over high heat, bring to a boil, and boil until potatoes are fork tender. Drain and return to pot, and mash using a potato masher, ricer, or fork. Transfer to a large mixing bowl and let cool until they are room temperature. Add flour, salt, and nutmeg to the cooled potatoes and mix with a large spoon until a dough starts to form. Use your hands to knead the dough for 2 minutes. On a well floured surface, roll dough out into a long rope about 1 centimeter thick. Cut the rope into 1 inch pieces. 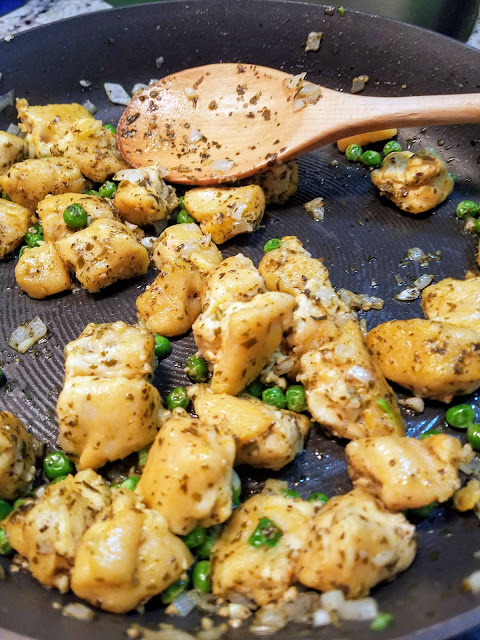 In a large skillet over medium high heat, saute garlic in 1 Tbsp olive oil. 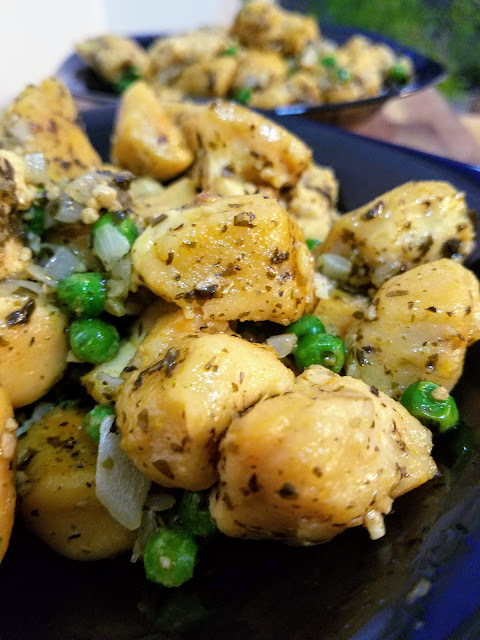 Once the garlic is fragrant and slightly browned, add gnocchi and carefuly saute until the gnocchi is heated through and slightly crisp on the outside. Add Italian seasoning and another drizzle of olive oil to serve, or add any sauce and toppings you'd like.